NGC 6888 is an emission nebula that features a bright central star. This star is classified as a "Wolf-Rayet" star and is a star that is nearing its end. The central star creates a strong stellar wind as it sheds off its outer layers. This probably is the cause of the structure of the nebula. Eventually, the central star will end its life in a spectacular supernova explosion. In this image, North is to the right. This image is cropped to 93% of the original frame. SQM Reading Bortle 4 on all 8 nights, typically 21.40 to 21.50. Some narrowband data captured with Moon up. Software Used Images Plus 6.0 for camera control, Images Plus 6.5 for calibration, stacking, ArcSinH stretching, star size reduction and feature mask. Photoshop CS5 used for levels and curves, lab color, saturation adjustments, selective color, match color, high pass filter, narrowband colorizing and stack blending. Gradient Xterminator for gradient removal. Carboni Tools for additional noise reduction and smoothing. HLVG for additional color correction. Registar 64 for subexposure alignment. Focus Magic for focus restoration. Pixinsight for narrowband/RGB combination. 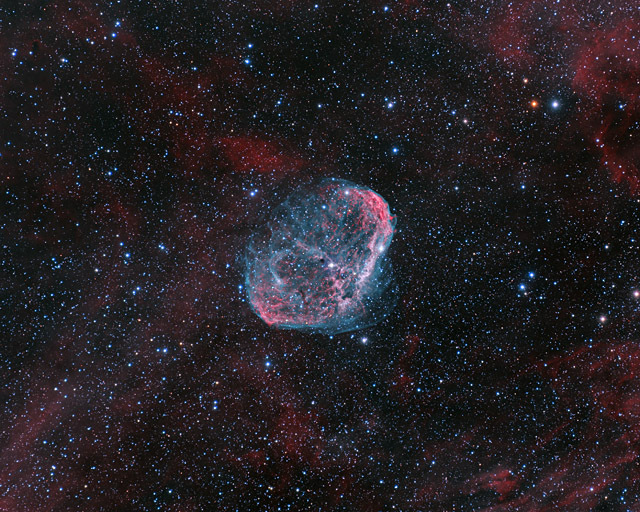 Notes I had photographed the Crescent Nebula back in 2011 with my C8 and Canon 20Da. I was never happy with the image as it was one of the worst looking astrophotos I had ever produced. I finally had a chance to correct that this past summer and my new image is miles ahead of the old version. I particularly like the way the OIII data shows in this newer image. This image was published by Astronomy Magazine as its Picture of the Day for September 28, 2018!